Stay at one of the best hotels in Mysore! If you are looking for Hotels in Mysore, drop in at Kings Kourt to experience a luxurious stay and royal treatment. 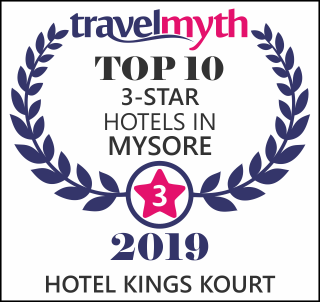 The 3 star hotel in Mysore, is located only half a kilometer away from the Mysore railway station and within reach of all the popular tourist locations. ENjoy the bountiful beauty of Mysore along with the 5 star amenity accommodation of Kings Kourt. Enjoy your premium stay at Kings Kourt, Mysore! Luxury and Kings Kourt goes hand in hand, we do not compromise on your comfort which is why customers love us. We have 50 spacious air conditioned rooms with safe deposit lockers and WIFI. We also offer services like in-house laundry, travel assistance and buffet breakfast. Kings Kourt Mysore hotel booking can be done online or by giving us a call. Kings Kourt Hotel offers spacious rooms equipped with wifi and cable/satellite channels. A satisfying breakfast is available each morning at The Kings Kourt Hotel, for guests with day trips planned, the hotel provides packed lunches if required. The hotel is ideally situated for sightseeing in Mysore. It is also within walking distance from the Mysore railway station. Visit Kings Kourt, your ideal choice of business and leisure 3 star stay hotel. Being located so close to the Mysore Railway Station, Kings Kourt is considered to be one of the best hotels in Mysore! We provide premium services at the rates of budget hotels in Mysore along with 5 star amenities. Kings Kourt is an excellent hotel, with comfortable rooms, good food and very close to CFTRI, train station and other things in Mysore. The service was good and the rates are affordable. Every time I am in Mysore, I stay in this hotel and highly recommend to business and family travellers. I've stayed in this hotel for about 4 days. We had an amazing experience. Here food is very delicious. Staffs are very friendly and ask everything that is necessary. They also provide us a map of tourism in Mysore. They also book a taxi for us when we went out there. They also serviced our room many times perfectly. It's a loveable and fantastic hotel !